As the NFL gets ready for week 10 of the season, many fantasy football players are trying to get their teams in position for the playoff race. 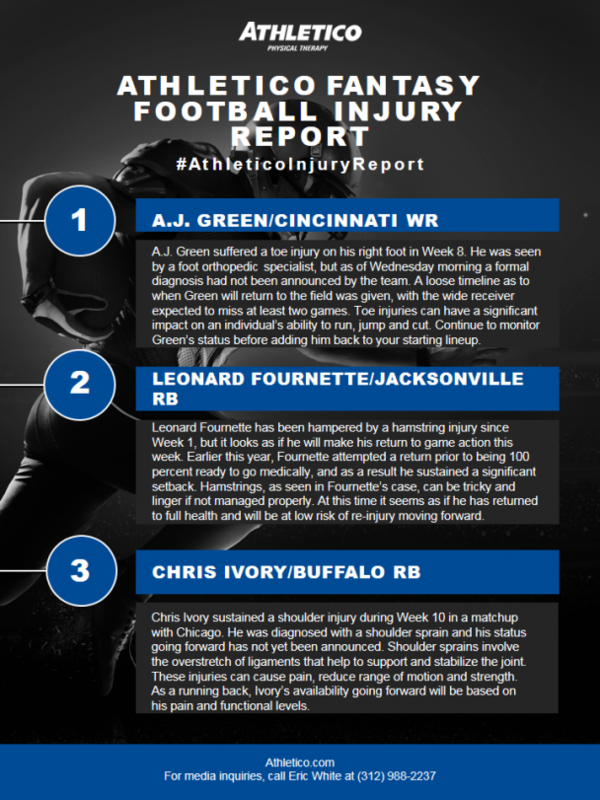 To help fantasy players add a win to their record, our very own Brandon Bowers, PT, DPT, is providing insights into player injuries that are impacting the league. These insights are put together inside the Athletico Fantasy Football Injury Report. In this week’s edition of the #AthleticoInjuryReport, Brandon is giving tips to those considering starting A.J. Green, Leonard Fournette and Chris Ivory. Learn more by checking out the infographic below (click to enlarge).